The river was channelled to form a moat around the city, while bridges and main gates into Shushtar were built to the east, west, and south. Several rivers nearby are conducive to the extension of agriculture; the cultivation of sugar cane, the main crop, dates back to 226 CE. A system of subterranean channels called Ghanats, which connected the river to the private reservoirs of houses and buildings, supplied water for domestic use and irrigation, as well as to store and supply water during times of war when the main gates were closed. Traces of these ghanats can still be found in the crypts of some houses. This complex system of irrigation degenerated during the 19th century. 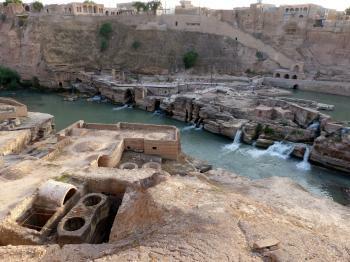 Despite reading the documents for this WHS prior to our visit in Apr 2016 I still didn’t feel that I had gained a good understanding of what it really was – and those pictures of a ruined bridge with a river or of some waterfalls, together with Wiki’s description of Shushtar as “an Island city”, didn’t exactly help. Having now been there, however, I find the UNESCO short description “spot on”. But how to bridge the gap for someone who hasn’t been there? The description of the site as being a “Hydraulic System” perhaps needs some explanation. The UNESCO map lists 13 elements (and the locally available tourist map pushes this up to 26!). In its broadest sense, the totality (which spreads far beyond the inscribed 240 ha) indeed constitutes a “system” of man made structures started under the Achaemenids, c2500 years ago, and developed most significantly under the Sassanids (c300AD), for managing the waters of the River Karun (which Wiki states to be “Iran’s most effluent river”) around the town of Shushtar for a range of purposes – particularly agriculture and milling. These structures include dams, bridges, canals, mills etc. It developed across many centuries and, in fact, the most recent inscribed element is a hydraulic power station and ice factory dating from “1323 Solar Hejira” (1905??)!! And what of the “island city”? 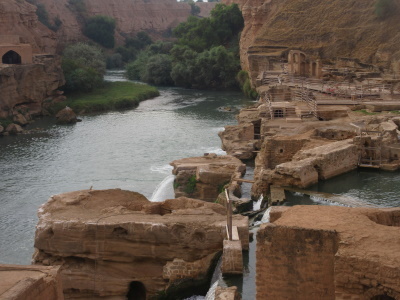 It is true that the canals do indeed create an “island” on which old Shushtar sits, before they rejoin the Karun, but this isn’t really a significant aspect of the whole, other than the fact that you will need to cross a bridge of some sort or another in order to enter/leave the town. The UNESCO map shows 3 main “clusters” of locations (all within the single inscribed area). We concentrated on the 2 in the north (Numbers 1-5 and 8 -10) where the waters are diverted into 2 canals – the Gargar and the (much older) Dariun. Only one of these – the “Waterfalls and Mills area” is “pay to enter” (The usual 200k rials = US $6). This will take around 1hr +. The rest can be viewed at your convenience and we did so on the following morning. Outside the ticketed area there is a bridge-dam which holds back a diverted arm of the Karun (some of the best views of the site are from the lane leading off the eastern side of this bridge). It feeds the waters to a series of mills, either directly or via a mill pond carved from the sandstone cliffs At the edge of this pond “mills” in the form of vertical tunnels with a lower exit hole have also been dug. The pressure of the “head” of water in these tunnels created a stream of water from the exit hole which turned wooden paddles in mills built in to adjacent man-made chambers. Used/excess water then escapes through channels to create the “waterfalls” which are emblematic of the site. There would have been some 45 of these mills on both sides of the canal for shelling rice, producing flour and sesame oil etc. It appears that, by the 1970s the entire system was abandoned and run down. At which time local initiatives commenced to “save” it as a historical monument. It is certainly an impressive technical achievement - especially considering its original date of creation. We visited in the evening, although a morning visit would be better for photography as the sun would then be shining on the right hand side looking downstream - the side with the “active” waterfalls! There were on-site photos of water flowing from the mills on the other side but these were all “dry” for our visit – whether this is permanent or not I don’t know. You cannot actually reach them but, on the right hand side, the visit followed a series of rather ugly walkways constructed of scaffolding and wooden planks - rather over-engineered with “health and safety” in mind I suspect! Our visit the next morning was by car to the area of the Dariun Canal and the Pol-e Shadorvan bridge dam (UNESCO map 8,9 and 10) and also to the upstream aspects of the Gargar Canal, close together at UNESCO points 1 and 2. In all honesty there isn’t a great deal to see at either. The “idea” that the Dariun Canal dates back to Darius the Great is far more “exciting” than the narrow defile and the rather muddy stream which currently passes along it. Similarly the rather decrepit ruins of the Shadorvan bridge/dam really only gains “interest” with the knowledge that it was constructed by Roman soldiers who, under their leader Emperor Valerian, had been captured (the only Roman Emperor ever to be so and he died in captitivty) by the Sassanian Shapur I, at the Battle of Edessa in AD 260. This structure is sometimes stated to be the most easterly “Roman” bridge and dam ever built! Ibn Battuta: "I came next to the city of Tustar [Shushtar], which is situated at the edge of the plain in the dominion of the Atabek and the beginning of the mountains... It is encircled by the river called al-Azraq, which is a marvel... On both banks of the river, there are orchards and waterwheels..."